My love of Patrick Hamilton is far from being a secret - I've previously reviewed Hangover Square and The Slaves Of Solitude on this blog. But for some reason it's taken me far too long to get round to reading one of Hamilton's most acclaimed books, Twenty Thousand Streets Under The Sky. 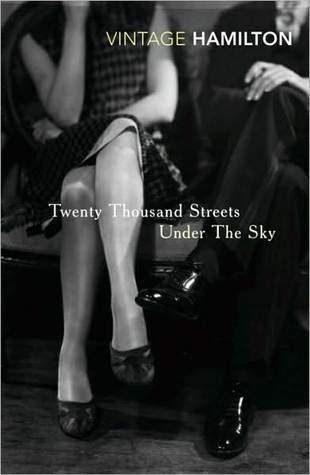 Although it only seems to be in print as a single volume these days, Twenty Thousand Streets Under The Sky is technically an omnibus edition of three short novels: The Midnight Bell, The Siege of Pleasure and The Plains of Cement. The books were originally published separately from 1929 to 1934, before being brought together into one volume in 1935. The three books tell the story of short periods in the lives of three working class Londoners who are, one way or another, attached in some way to the Midnight Bell, a pub off the Euston Road. Bob is the pub's drinks waiter and Ella is the barmaid, while Jenny is a prostitute who occasionally drinks there. Ella is in love with Bob, but Bob is in love with Jenny. Jenny, however, isn't in love with anyone at all. Deep down, Bob knows this, but this doesn't stop him spending increasing amounts of his savings on her. The character of Jenny (apparently based on a real prostitute Hamilton was infatuated with as a young man) is portrayed in a way that seems deeply unsympathetic in The Midnight Bell. Bob, repeatedly, endures her standing him up and taking his meagre savings with no intention of ever paying him back. But The Midnight Bell is a story told from Bob's point of view, and it's in The Siege of Pleasure we learn more about her. The Siege of Pleasure is devoted entirely to Jenny, and is a painfully plausible account of how an almost teetotal 18-year-old with no money or family but a strong attachment to respectability falls into alcoholism and prostitution astonishingly quickly. The poor choices Jenny makes are, on the face of it, small ones, but the consequences are huge and I defy anyone not to want to reach into the book and rescue her from her fate, and the exploitative people around her. The third section of the book, The Plains of Cement, is Ella's story, and the events in it happen more or less concurrently with Bob's ill-fated, destructive pursuit of Jenny in The Midnight Bell. Hamilton is an astute observer of absurd of human traits, behaviours and above all, weaknesses, which makes all three books darkly funny, but at the same time, they're heartbreakingly sad, even bleak. The Plains of Cement felt, to me, both the funniest and the saddest of the trilogy, perhaps because Ella - plain but presentable, fond of children, desperate to rescue her mother from her abusive, miserly stepfather and racked with guilt when she finds herself secretly hoping that he'll die - is ultimately such a likeable character. Aware that her love for Bob will be forever unrequited, and wondering how she might ever continue to support her mother, she finds herself considering marriage to an older, moderately well-off man with whom her relationship is so stilted that she can be barely bring himself to call him by his first name. The descriptions of Ella's dates with Ernest Eccles are painfully, hilariously, almost tragically awkward that it's impossible not to feel sorry for her as she desperately tries to convince herself that she could bear to be his wife. All Hamilton's characters are so expertly drawn that they come to life in just a few sentences. His ear for dialogue is exceptional and anyone who has worked in a traditional pub, as I have, will recognise the regulars of the the Midnight Bell from the moment they speak. Although these books were published almost 90 years ago, and are packed with period detail and atmosphere - choking city fog, Lyon's Corner Houses, matinees at the pictures with a B-picture before the main feature - the characters themselves could easily exist today, albeit with different life choices available to them. Their thought processes, which Hamilton often details minutely during their interactions, are convincing and compelling. London itself, so beautifully evoked in the trilogy's title, is a vivid a character as any of the human beings in the books. There's a strange sort of poetry in the litanies of street names, and in the pub names too (plenty of the pubs, such as the ones listed during Bob's trip to Hampstead Heath with Jenny, still exist) powerful sense of a city teeming with human life of a uniquely English kind. Patrick Hamilton's vision in Twenty Thousand Streets Under The Sky is a bitter and pessimistic one, almost misanthropic, and I don't recommend it to anyone looking for something uplifting. But it is very funny, and it has a genuine tragic beauty to it of a kind I don't think I've seen replicated by any other author writing about working class characters at this time. I know this is a book I'll return to again and again.